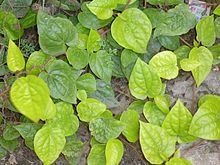 The betel (Piper betle) is the leaf o a vine belangin tae the Piperaceae faimily, which includes pepper an kava. It is valued baith as a mild stimulant an for its medicinal properties. Betel leaf is maistly consumed in Asie, an ensewhaur in the warld bi some Asian emigrants, as betel quid or in paan, wi or wioot tobacco, in an addictive psychostimulatin an euphoria-inducin formulation wi adverse heal effects. Betel is notable for stainin the teeth o regular uisers. ↑ Betel-quid and Areca-nut Chewing and Some Areca-nut derived Nitrosamines. IARC Monographs on the Evaluation of Carcinogenic Risks to Human. International Agency for Research on Cancer. 2004. pp. 33–34,41–44,173–221. ISBN 978-92-832-1285-0. PMID 15635762. ↑ Betel-quid and Areca-nut (PDF). IARC Monograph Volume 100E. International Agency for Research on Cancer, Geneva. 2012. pp. 333–364.